This film from 1957 is such a stylish musical from, of all people, George Cukor. The cast is attractive and the chemistry is infectious - Gene Kelly (his last starring film for MGM), Mitzi Gaynor, Kay Kendall and Taina Elg. And, of course, the men in the girls' life - Gene Kelly himself, Jacques Bergerac, and Leslie Phillips. The music by Cole Porter is very good and it was his last motion-picture score. But the book by playwright John Patrick is so top-heavy and it never resolves itself to anybody's satisfaction. It is based on a story by Vera Caspary. We're left with the old man who carries a billboard, "What Is Truth?" Truth is highly relative, it would seem. Was Gene Kelly "a dog" in heat or was he under the sway of Jacques Bergerac and Leslie Phillips? It's your move, I guess. You're so right that the story doesn't hang together totally, but this movie is such a treat to watch. I've loved Mitzi Gaynor ever since I can remember and Kay Kendall is too precious for words. One of the few times I've seen Taina Elg is in this movie, but I love her as well. The three of them in the "Ladies in Waiting" number are wonderful; they really do seem like an "act", which makes the premise of the movie ring true. But you're right; once the whole thing hits the courts it gets pretty muddy. It's much better to just relax and watch some of the most stylish musical numbers ever put on film. All it needed was Dolores Gray to make this musical nirvana. I love Taina Elg, too. I do wish that she had had more of a substantial film career at MGM. She did a film with Lana Turner, Glenn Ford, Leslie Caron and George Montgomery, too. She also starred with Kenneth More in the English re-make of "The 39 Steps". Years later, I saw her in the Broadway revival of "Where's Charley?" and as one of the women in "Nine". In both productions, she appeared opposite Raul Julia. Taina Elg was a ballerina, but most of her movie work was in dramas or comedies. It's good to see her put her musical talents to good use. The last I heard of her was when she had a featured role on stage in the musical version of "Titanic". I'm old enough to remember when CinemaScope was introduced, an innovation that I loved. So I always have a fondness for the movies from that era, even the lousy ones. The first widescreen musical was There's No Business Like Show Business and at that point they hadn't quite figured out how to deal with all that space. Some of the numbers looked like they were filmed in an airplane hanger and featured all sorts of extra added nonsense just to fill the screen to capacity. 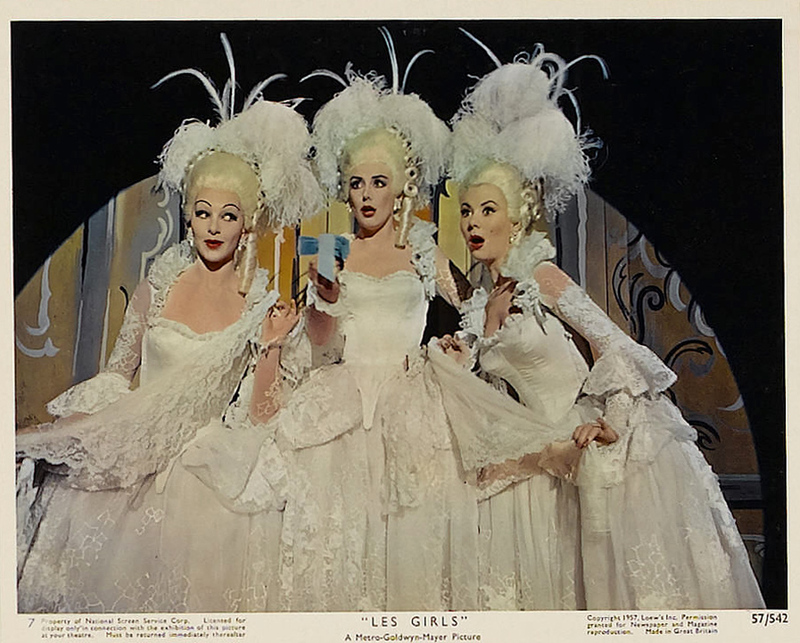 By the time Les Girls came along they'd figured out widescreen wasn't about capacity; musical numbers could be streamlined and elongated in really elegant ways. As well as Les Girls, Daddy Longlegs is another example of a very stylish and "modern" use of widescreen, in particular to enhance choreography. (Funny Face and Silk Stockings too.) It was a great era in graphic art in general, when the 1950's were starting to morph into the early 1960's and all that deluxe "Mad Men" coloration and configuration. Les Girls was a prime example of what was now possible and it's such a shame that musicals were beginning to fade just when they were really getting their footing in the new medium. I just listened to an interesting interview with Taina Elg. She said that she came along at the wrong time - it was over for musicals on the screen. She wishes that she had arrived in Hollywood ten years earlier. She has no complaints about MGM - they treated her very well. But she was trained as a ballerina - and her films didn't take advantage of her training. She asked for her release from her seven-year contract. MGM gave it to her. At the time of the interview, she was appearing in "A Little Night Music" in Melbourne, Australia. If she had arrived earlier, she probably would have competed for roles with Leslie Caron and Cyd Charisse. Very exalted company to be in. Did you notice that Alicia Malone referred to her as Tania (Tan-ya) Elg? Homework, girl! Such a shame that it should have been Gene Kelly's "last hurrah" at MGM. Has TCM ever shown Marjorie Morningstar, which Gene made for Warner Brothers right around this time? I remember it being kind of an odd film, but I'd love to see it again. I guess mostly he turned to directing. I thought A Guide for the Married Man was pretty appalling, but that was more the material than Gene. No matter what anyone says, I loved Hello Dolly and thought he did a genius job of directing it. You can watch Marjorie Morningstar on YouTube, someone uploaded it. However it's obviously from a homemade VHS copy of a TV showing, poor picture quality and widescreen image cut down to rectangular shape. May have been edited for TV too? It's a modestly enjoyable teen coming of age story, dated, but with some interest in seeing Natalie Wood in an early starring role. Kelly does a credible acting job, but little or no dancing. Ed Winn is excellent in a small dramatic role, genuine, heartfelt, unaffected (unlike his comic persona). I have never seen "Marjorie Morningstar". I do have the book, though. But I have never read it. My grandfather felt the same way about being just slightly too late. He was a drummer for big bands, and his charts were highly coveted. He performed on several late musical scores, but it was the late 40s, and he didn't get his foot in the door with the studios. He was colleagues with Buddy Rich, Louis Prima, Frank Sinatra, Ann Margaret, Bob Newhart, and the great Mr. Duke Ellington. However, because of when he came along, he was always the boy on the outside of the glass looking in despite being considered by Buddy Rich as his successor. My grandfather also had a beautiful singing voice, but the U.S. was changing its preference to younger singers and styles. I love Les Girls as a model of what might have been and for people like its characters who were dedicated artists trying to make a living creating art for the enjoyment and entertainment of the world. Love. Love. Love. Gene Kelly's reign at MGM was from 1942 until 1957. He accomplished a lot in those fifteen years. I do wish, though, he had wanted to be a more significant part of "The Young Girls of Rochefort". But, still, that film is, first and foremost, a Jacques Demy creation.